Set up and administered by Totnes on the Move, the e-bike scheme is now looked after by Mary Popham at TTT. 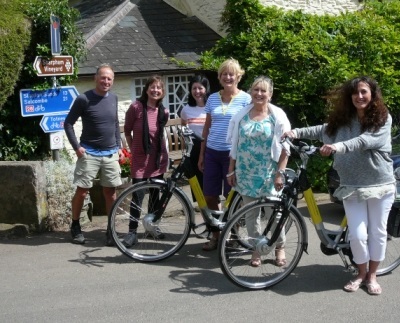 The Totnes Community Electric bikes project has several electric bikes available for 2015. For a small annual fee, several individuals (usually 5 or more) share the use of a bike in their area, with one household 'hosting' the bike in a suitably accessible place. The electric bikes are insured and regularly serviced and are fully equipped with panniers and lights. In addition, Leatside surgery also hosts an electric bike through the project. This bike is available to hire by the week at minimal cost. Ask at reception if you are interested.